Summary: Here's a review of the best value I've found in an USB logic analyzer. After I reviewed the Logic 16 (http://www.embedded.com/electronics-blogs/break-points/4420012/Logic16) several readers mentioned the LogicPort, another USB logic analyzer (LA). The folks at Intronix (http://www.pctestinstruments.com/) kindly sent me one. At $389 the LogicPort is a bit more expensive than most of their competitors. But that $389 buys tons of additional capability. The specs are impressive. It supports both state and timing modes (in the former the LA acquires on a clock from the target board), at rates to 500 MHz in timing mode and 200 MHz in state mode. 500 MHz for $389 is a heck of a deal. Can you actually sample 500 MHz signals with this unit? Perhaps, but the probes are rated at '<5 pF.'" At 500 MHz the reactance of a 5 pF probe is 64 ohms, which a lot of modern logic simply can't drive, so, as always, do the math. This is not to slam the LogicPort; some expensive scope probes have worse characteristics. 34 channels are available (two are used as clock inputs in state mode). The unit runs at the rated speeds no matter how many channels are used. The buffer, with 2048 entries, is very small by today's standards. But the analyzer only stores transitions in the input data so conceivably, for slowly-changing data, the unit can acquire data for long periods of time. Upload speeds to the PC are virtually instantaneous. Triggering is completely off the charts for a USB LA. Trigger on a pattern, any combination of edges, values (like greater than, in range, etc) or duration in time. There's a holdoff that can wait until any number (up to about a million) of trigger events occur. Two of these triggers are available, and the user can combine them to start an acquisition when either trigger is satisfied, or when they happen in a specific order (for instance, first A then B). Advanced triggering like this is indispensable for capturing complex or infrequent events. Some other LAs have enormous buffers and more limited triggering capability. The argument is that big buffers capture everything, so triggers are less important. I do want a big buffer, and am somewhat ambivalent about the triggering argument. Do you want to search acquired data, or acquire the data you want? For capturing rare events I prefer the latter. Logic levels are adjustable from -6 to +6 volts in 50 mV increments, which is far more resolution than most of us need. But 1 volt logic is here, today, and the difference between a zero and a one can be pretty small. The LogicPort offers the usual ability to name and combine signals into busses ("groups" in LogicPort parlance). Groups are extremely easy to set up and configure - easier than on any other USB LA I've used. One unusual feature is the ability to take notes in a little window; they get saved to the project file, so could be a reminder about setup parameters or other experimental conditions. The connection leads are color coded but unlabeled. With so many leads the connections are not obvious so you'll have to use the cheat sheet in the help file. And that does not show the physical pinout of the wires on the Logicport. Pin 1 is noted on the hardware, but nothing specifies the counting sequence. Deduce it by looking for how patterns in the colors line up with the cheat sheet. A Mictor adaptor is available for $139. 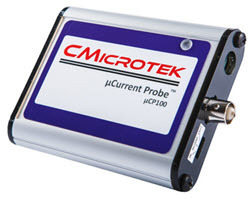 Mictor is Amp's solution to instrumenting high-speed logic signals without using gobs of probes that can be hard to connect. It seems that by the time I've connected 30 or more probes to a target board the first half dozen have popped off. Mictor uses a single connector to attach all channels at once with a standardized pinout compatible with LAs from the big vendors (Tektronix, Agilent, etc). If you need to bring fast busses off a board, do look into Mictor. I found the UI baffling at first and the help file wasn't that helpful. The company's web site is packed with glowing praise for the super-intuitive UI, so maybe it's just me. Spend a minute with the UI and you'll be frustrated. A half-hour of experimenting with it and the wisdom behind the design appears. With practice, it's very easy to use and offers a tremendous range of capabilities. Absolutely everything is configurable. One very nice feature is the ability to add four "measurements" to the bottom of the screen. My Agilent mixed signal scope does this too, and it's an incredibly handy feature I use all of the time. The LogicPort will measure frequency, period, duty cycle and the like for any input channel. Like many of these USB logic analyzers, the LogicPort will read and dissect serial streams from common protocols like I2C, SPI, CAN and others. With the exception of the poor help file (which substitutes for a user manual) and the short buffer I liked everything about the LogicPort. The extensive triggering, fast acquisitions, wide number of channels, and inexpensive price distance this unit from all other USB LAs I've tried.